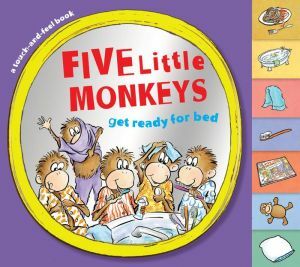 It's bedtime for Five Little Monkeys--but they have a lot to do to get ready! Look at those faces covered in sticky spaghetti sauce! Into the tub--splish splash. Put on some soft pajamas, and don't forget to brush those teeth. Then it's time for a story and sweet dreams--but the five little monkeys have another idea! Little fingers can touch the sticky, soft, and furry elements throughout the book, and easily help turn the tabbed pages as they follow the Five Little Monkeys in a bedtime routine that is both familiar and full of surprises!